My research investigates marketing as a sociological design process - how technology, culture, language, and institutions dynamically influence consumer behavior. Manuscripts under review upon request, email me. Most of my current research revolves around a marketing subfield called "market system dynamics (MSD)". The figure on the right (taken from Giesler and Fischer 2016, MT) illustrates some of the theoretical benefits of this lens. 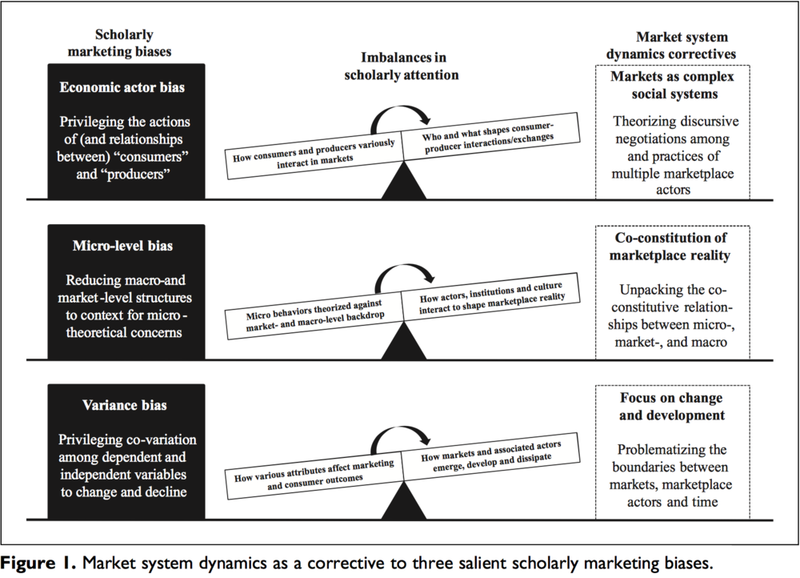 To learn more about the theoretical and methodological benefits of the market system dynamics lens, please read this Marketing Theory special issue or this Journal of Consumer Research tutorial. To learn more about the "applied" benefits, please read the Big Design Blog or visit Big Design @ American Marketing Association. To learn more about how I came embrace this approach, please read this interview. Learn more about my research in the classroom.